Lost, the Complete Second Season boldly announces itself as “The Extended Experience.” This is in contrast to the first year’s collected episodes which were simply titled “Lost, The Complete First Season.” I’m not sure how the second season’s collection extended my experience any more than the first, but if you’ve got the first one and are waffling on getting the collected second season, go ahead and do it. How on God’s green earth you would have the first set and not spring for the second would be a mystery, but then so much about Lost is mysterious. Having all the second season’s episodes at your fingertips wrapped in it’s handsome packaging will look just So Right on the shelf next to Season One. At any rate, we all know what you are really after, and that’s the fabled Disc 7 of the set... the one with all the bonus features and goodies. You can download all the rest of the stuff using iTunes. I reviewed Lost Season One for Movie Habit last year and the general analysis of the first season (genuine thrills, if a little directionless) holds up for the second. Of course there has been some evolution. 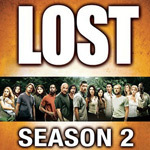 With the surprise success of the first season the writers and producers of Lost were faced with a problem perhaps more daunting than trying to create a new TV series. That problem was how to continue its success. They seem to have pulled it off. It’s been a busy year on the island... OK, 6 weeks “their time.” Season two saw a rising complexity of the story line. Maybe “story line” is not quite the right word. Let’s say “premise” instead — this is broadcast TV after all. We’ve lost a couple of the original people, who are dead and gone for good... or are they? And the show has gained a whole new cadre from the missing tail section of the plane. The Others are now a defined group who’s story is mixing with the survivor’s. Probably the most significant new character to be introduced isn’t a person at all but the bunker-like Hatch. With the addition of The Hatch ( and it’s bottomless supply of modern contrivances) the writers have created a way out of the Robinson Caruso/Survivor cul-de-sac, pumped up the characters’ motivators and kept the mysteriousness at first-season levels. There is also a tone of earnestness seeping into what was once just a kind of goofy/creepy carnival fun ride. The show is maturing; everyone is taking it more seriously, and the characters are doing more serious things or having serious things done to them. Beatings, torture, cold-blooded point-blank murder are all on board. Gone are the bump-in-the-night monsters and tropical polar bears. Now our castaways have to adhere to the rat’s wheel number input schedule or all Hell breaks loose. And in case you thought it was all a red herring, at one point Hell does break loose. The heretofore unseen mysterious “monster” has shown itself as an equally mysterious animated black cloud, and for that I’ll tip my hat to the Lost crew for keeping the magic alive. Along with the serious tone are some serious new characters most notably Adewale Akinnuoye-Agbaje (Mr. Eko). With the arrival of Mr. Eko’s impressive presence into the main population, things really do start to get serious. I’ve been thinking that the show responds to the resources at hand rather than the resources being made to conform to the show’s narrative. In other words, not only are the writers and producers making this up as they go along, but in a sense the show is driving itself. This is perhaps demonstrated by Akinnuoye-Agbaje’s character being so intimidating that even The Others are afraid of him. The entire second season is a ramped-up version of the first. Everything is bigger, faster, more dangerous than in the first season including the ending which presumably is the set-up for the third season. One wonders how many times they can go to that well. Indeed at the end of the first season Jack and Locke are looking down the well of the Hatch’s shaft, a grand iconic vision. SPOILER ALERT for the rest of this paragraph: The second season ends with a midnight phone call taken by a peripheral off-island character (there IS an off-island world after all!). Will widening the stage dilute the premise? Looks like we’ll have to wait for Lost Season Three to find out. And we’ll see if they can keep up the pace for yet another year. I do have a little nit to pick with Lost and that is the constant use of flashbacks. A hint now and then to a character’s background would be fine. Indeed some ambiguity would help fuel the fan-base’s speculation and sense of participation, but to keep making it half of the show is a bit much. This might be the broadcast TV industry’s natural inclination to screw up a good thing. It may be the writer’s dream to craft little short-story vignettes and character studies and the network’s natural desire to have free-standing episodes for later syndication but it is Lost’s linear on-island narrative that keeps us coming back. But back to the fabled Disk 7 of the set. The bonus disk has one of the best navigation set-ups I’ve seen in a DVD. Using borrowed “footage” from the Dharma Initiative instructional film, they’ve made a great little intro gimmick. It’s a perfect fit and right on the money. My hat’s off to the people behind the season two DVDs. The only problem is that, like a Flash animation on a web page, once you’ve seen it, you really don’t want to see it again, and it becomes annoying. So multiple passes through the navigation environment can be tedious. In keeping with the overall serious tone of the second season, the bonus features of Disk 7 are heavy on production notes and other practical details of the season’s creation. This will please the fan-boy in all of us that wants to know everything about the show. It makes you feel like you’re really part of the family. The sense I got was that everybody who’s associated with this program has been giving a lot of thought to what it all means, and in particular what they now have to do to keep it afloat. It’s as if they suddenly became aware that people are actually watching. Come to think of it, “Extended Experience” must have been exactly what they felt. There are cast and crew interviews, back stage info, fans opining on What It All Means, and production notes. There is also the “Lost Connections” which promises “Shocking Character Connections” that will be uncovered in “This Exclusive Immersive Experience.” I can’t tell if they are having fun with this, or whether it’s supposed to be serious, but I gave it a pass. “Jimmy Kimmel Visits the Set of Lost” was a fun addition to the Season One set, but there’s nothing like that the second time around; even the bloopers are a little anemic. Consistent with the Season One set, is the absence of any contribution by Terry O’Quinn (Locke). In fact all of the “first tier” characters are absent with the exception of a very enthusiastic commentary track by Evangeline Lilly (Kate). Maybe it’s not the coolest thing to do, but Ms. Lilly did a stand-up job of infusing her commentary with a real spark. However, it is only one of five commentaries and out of approximately 24 episodes, that seems to me to be a bit thin. The writer’s and cinematographer’s comments were interesting additions, demonstrating that a lot of people go to a lot of trouble to make this series. The production values of Lost remains first rate — better than you’d expect from broadcast TV. ABC may have gambled on the first season, but they are protecting the franchise in the second. On the off chance that you waited for the boxed set to come out before watching the second season, you’ve got your work cut out for you. There are 24 episodes and as with the first season’s boxed set, I recommend putting a little time between episodes. For those of you who did watch the whole season, go directly to the fabled Disk 7 and start doing your homework. In your free time, go back and pick out the episodes with commentaries and watch them. And yes, the shark does have a Dharma logo on it.